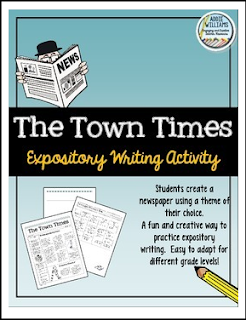 Expository Writing - A fun and creative way for students to learn about expository writing! Students practice writing in 3rd person, answering the 5 W's and working in the style of a newspaper. Can easily be adapted for different ages and abilities. Assignment sheet is in the style of a newspaper as an example. Includes 6 pages - assignment sheet, brainstorming worksheet, 3 newspaper templates and a detailed marking rubric. Ontario Teachers: This resource can help prepare your students for the OSSLT!